Planning to present a gift to your dear ones this Ramadhaan, particularly for those who can’t read or too old to read, think about a pen that could read and recite the holy Quran for them. This is the latest MUST HAVE educational product for Muslims, a smart and wonderful tool for both children and adults. Quran Readpen is a new learning and teaching technology, where voice can be heard from the pen speaker when pointed on the specially printed Quranic pages. The recitation voice is clear, full and beautiful. No computers are required, so you or your children can recite anywhere, at any time in just 3 EASY STEPS! 3. Recite the verse with ease and confidence! Read Pen can read any word, page, Sura or Aya by only touching the text in the Holy Qur'an Book. We are Proud to launch this Product which makes Quran Majeed Learning & Understanding More Easier for Every One. 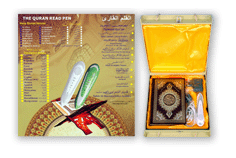 EQuran also called Quran Speaking Pen,Quran Read Pen,Touch Talk Pen, Quran Reading Pen, Quran Pen etc.